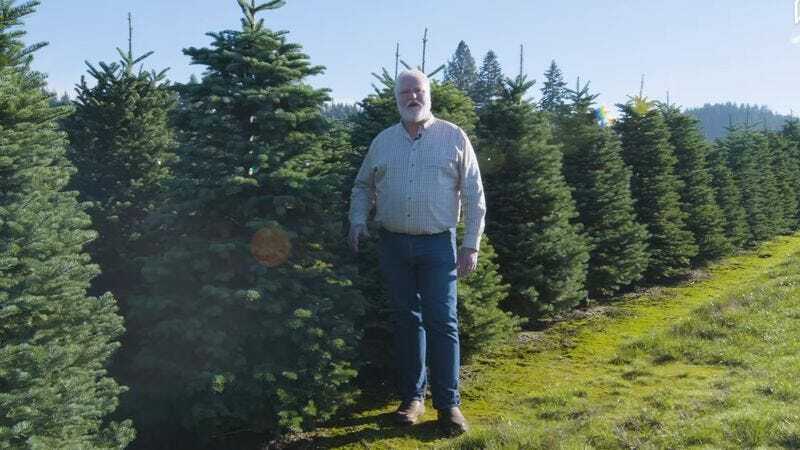 For an episode called “Treepocalypse Now,” the documentary filmmakers at Great Big Story headed out to Corvallis, Oregon, home of Holiday Tree Farms; at 8,000 acres, it’s one of the largest Christmas tree farms in the world. There, veteran tree farmer Mark Arkills has a daunting challenge in front of him: harvesting a million trees in just six short weeks. The trees have to be cut down, processed, and put on a truck in a very brief window of time. “That means you gotta move fast,” Arkills explains. “As soon as harvest starts, it’s time to call in the cavalry.” Apparently, the quickest, most efficient way of harvesting Christmas trees is by helicopter. After the individual trees are cut down by chainsaws, it’s time to attach them to a harness and fly them to a waiting truck. It almost looks like the trees are being medevacked to safety. Arkills says a helicopter can harvest about a thousand trees an hour. They’re our number one competition, obviously. We real tree farmers have a saying about fake trees: Nine years in the house, nine million years in the landfill. They cannot be recycled. It’s Christmas. Keep it real.